Luxury river cruise specialist Avalon Waterways has released a new mini-brochure detailing its most exotic itineraries around the world, on sale with earlybird savings of $300* per couple. The 2014 Avalon World Collection features 12 different itineraries on the great rivers of Asia, Africa and the Americas, each offering the same levels of service and luxury as Avalon's European cruises. The selection includes journeys on the Yangtze, Mekong, Amazon, Nile and Mississippi rivers, as well as among the Galápagos Islands. 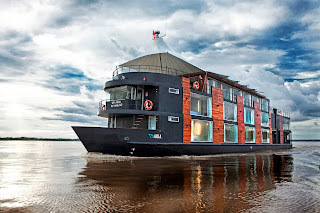 Joining Avalon's program in 2014 is the boutique Amazon explorer Aria, a contemporary 16-suite ship designed for cruising South America's greatest river in style. The Aria offers three-night cruises as part of an 11-day itinerary from Lima, From the Inca Empire to the Peruvian Amazon, priced from $6099* per person twin share (including earlybird offer). Other choices include the purpose-built Avalon Angkor cruising the Mekong through Vietnam and Cambodia. With just 16 cabins, it is the only luxury ship small enough to sail all the way to Siem Reap and is available as part of a 14-day itinerary Fascinating Vietnam, Cambodia & the River Mekong, priced from $3648* per person twin share (inc earlybird offer). In China, Avalon offers the newest luxury ships on the Yangtze, the Century Paragon and Century Legend, operating a choice of itineraries that include other highlights such as Beijing, Shanghai and Xi'an. They are priced from $3119* per person twin share (inc earlybird offer) for the 11-day Magical China & the Yangtze River. Avalon's earlybird discount of $300* per couple is available on all 2014 World Collection cruises booked by September 30, 2013, or until sold out. Further savings are available for early payments, additional tour bookings and Journey's Club repeat travellers. Photograph: The Amazon explorer Aria, joining the Avalon Waterways World Collection in 2014.